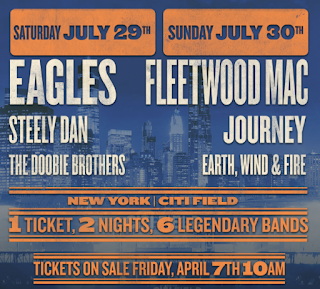 Nothing screams classic rock like the enduring musicality of Steely Dan, Fleetwood Mac, The Eagles and other legends brought to us by Live Nation's "The Classic" concert set. These events present both east and west coast crowds an unforgettable summer opportunity to experience some of the biggest names in classic rock history set in two historic and beautiful stadium venues. Sensibly entitled The Classic Concerts, Live Nation has sourced age-old favorites suitable for all generations, splitting each concert series into two days of rockin' performers. The Los Angeles performances are called The Classic West, and will take place at Dodger's Stadium over the weekend of July 15-16, while New York's series is titled The Classic East, and is set during the weekend of July 29-30. 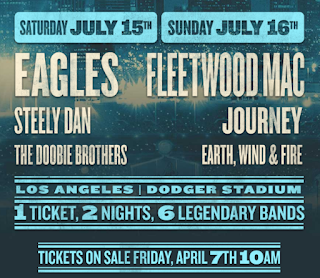 Single ticket admission is good for both days of this innovative festival, featuring The Eagles, Steely Dan and The Doobie Brothers on Saturday and Fleetwood Mac, Journey and Earth Wind & Fire on Sunday. What better way to see some of the most well-loved and lasting musical acts from the last century than in the iconic stadiums that house the Los Angeles Dodgers and The New York Mets? Each venue will also offer delectable eats and drink from both local and international vendors, designed to offer visitors an authentic music festival experience. Don't miss out on purchasing your ticket to this unforgetable event as tickets are sure to sell fast! Tickets go on sale Friday, April 7th at 10am, TheClassic.com. Dodger Stadium? Why don't they pick venues in safer areas? It's historic, a once in a lifetime & most likely final opportunity for all. Life isn't a dress rehearsal as they say. Get on the bus! They will not be on the same stage together. I might pay almost $2000 if that were true. I don't think of the Dodger Stadium area as unsafe. The east side of LA has the best restaurants and the most interesting neighborhoods. But the sound is awful at Dodger Stadium and unless you're on the field in front of the stage, I don't think it's worth the ticket prices. And having Journey on the bill is damaging to the Fleetwood Mac "brand". I'll wait til they do their own legit tour in a year or so.